Hillsboro High School student Brian Midkiff receives a tobaggan and poster from Who Dey, the Cincinnati Bengals mascot. In the background, Bengals wide receiver Brandon LaFell is shown participating in a live Skype session with Hillsboro students. Hillsboro High School and Cincinnati Ben Gals cheerleaders hold a $10,000 check Tuesday provided through a Fuel up to Play 60/Cincinnati Bengals/Midwest Dairy Association Hometown Grant. In the back, from left, are school board member Beverly Rhoads; Jessica Walker, Hillsboro food service director; Who Dey; high school principal Joe Turner; and treasurer Ben Teeters. Also shown is the Hillsboro food service truck that was largely responsible for the school receiving the grant. The Hillsboro City Schools have $10,000 more in equipment and several students were able to meet Cincinnati Bengals personnel Tuesday after the school won a Fuel up to Play 60/Cincinnati Bengals/Midwest Dairy Association Hometown Grant. Jessica Walker, food service director for the school, said the grant money had to be used to encourage and/or increase healthy eating and fitness. So, Hillsboro Elementary will receive a 12 feet wide by 6 feet tall climbing wall. Walker said it should be installed in a playground by January or February, if the weather permits. And the Sam Barnhouse Center at the high school/middle school received two new refrigerators that will be stocked with milk, fruit, low sodium cheese sticks and 100 percent juice that students can use to “refuel” after working out at the athletic center. Also as part of the grant, all Hillsboro students were invited to attend a chef’s event last month where they could learn how to make healthy snacks. And on Tuesday, Who Dey, the Bengals’ mascot, and a pair of Ben Gals cheerleaders, visited the elementary and high school/middle school. 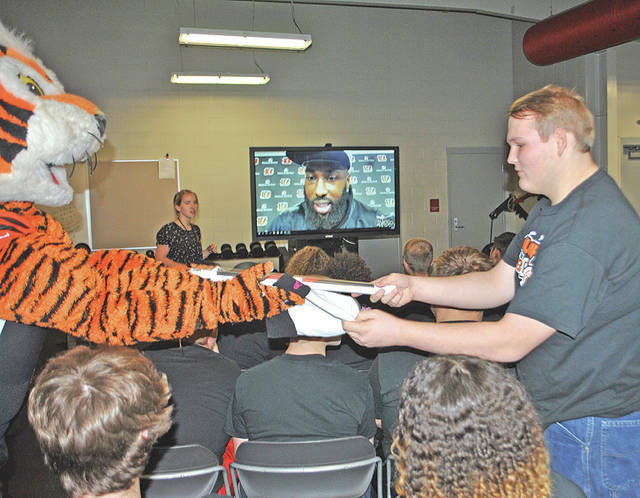 Around two dozen high school students were invited to take part in a live Skype session with Bengal wide receiver Brandon Lafell. The session lasted about 20 minutes. LaFell talked to students about fitness and healthy eating, the students asked him several questions, and then LaFell asked the students questions. The students received memorabilia including a toboggan, a mini football, a ball cap, posters and a cell phone for correct answers. Superintendent Tim Davis said it was all made possible because someone noticed the summer food truck the school purchased and used to deliver free lunches to hundreds of students on weekdays last summer. The process of winning the award started when a representative with the American Dairy Association visited the food truck. At the same time, staff at the Barnhouse Center was getting students enrolled in Fuel Up to Play 60, an in-school nutrition and physical activity program launched by National Dairy Council and NFL, in collaboration with the USDA, to help encourage youth to lead healthier lives. “The Bengals and the Diary Council loved our summer food truck and decided to recognize us by awarding us this $10,000 grant,” Walker said. She said that Hillsboro was the first school outside the I-275 loop to win the grant. One of the refrigeration units in the entrance to the Barnhouse Center has a video screen near the top where nutrition information can be relayed to students, or the school can replay past Hillsboro sporting events on it. She said anyone interested helping can contact the school or treasurer Ben Teeters. June Wedd, vice president of school wellness for the American Dairy Association, said it’s all about hometown engagement when a grant winner is being determined, and that the food truck was a perfect example of that. “There’s a need as well as a capacity to actually make change,” Wedd said of the food truck and the service it provides. Last summer the food program delivered meals to six locations Monday through Friday from May 30 to Aug. 4. It served as many as 625 meals in a single day and was averaging about 350 meals a day even before the new truck was put into service after June 16. Walker said the plan is to have the truck running again this summer. https://www.timesgazette.com/wp-content/uploads/sites/33/2017/12/web1_Grant-pic-1.jpgHillsboro High School student Brian Midkiff receives a tobaggan and poster from Who Dey, the Cincinnati Bengals mascot. In the background, Bengals wide receiver Brandon LaFell is shown participating in a live Skype session with Hillsboro students. https://www.timesgazette.com/wp-content/uploads/sites/33/2017/12/web1_Grant-pic-for-inside.jpgHillsboro High School and Cincinnati Ben Gals cheerleaders hold a $10,000 check Tuesday provided through a Fuel up to Play 60/Cincinnati Bengals/Midwest Dairy Association Hometown Grant. In the back, from left, are school board member Beverly Rhoads; Jessica Walker, Hillsboro food service director; Who Dey; high school principal Joe Turner; and treasurer Ben Teeters. Also shown is the Hillsboro food service truck that was largely responsible for the school receiving the grant.